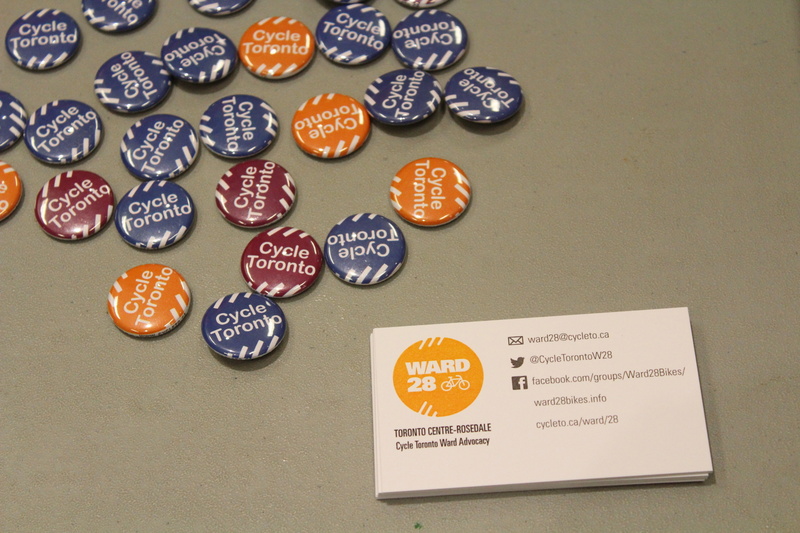 Inspired by last year’s Parkdale-Roncesvalles Cycling Town Hall in Ward 14 and Ward 30's bike summit in 2013, Cycle Toronto’s Ward 28 group hosted their own town hall. 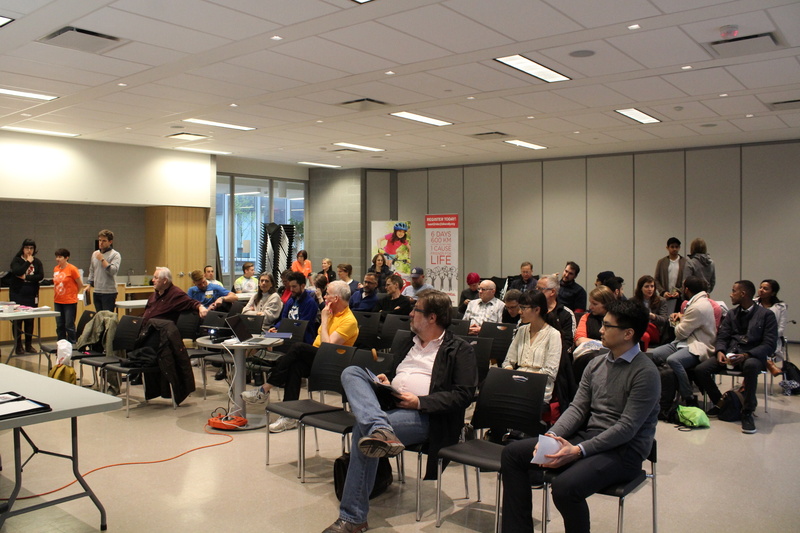 On May 4th, the same day as Jane Jacobs’ birthday, Star Wars Day, and the one year anniversary of city council approving the Bloor pilot project Ward 28 gathered for a town hall meeting. Not even the persistent rain and flood warnings could stop roughly 30 community members from coming together at the Regent Park Community Centre on Shuter Street! With Peter Rogers as the emcee, he welcomed community members from diverse neighbourhoods such as the Distillery and Canary Districts, Corktown, and Cabbagetown, as well as introduced the five keynote speakers. 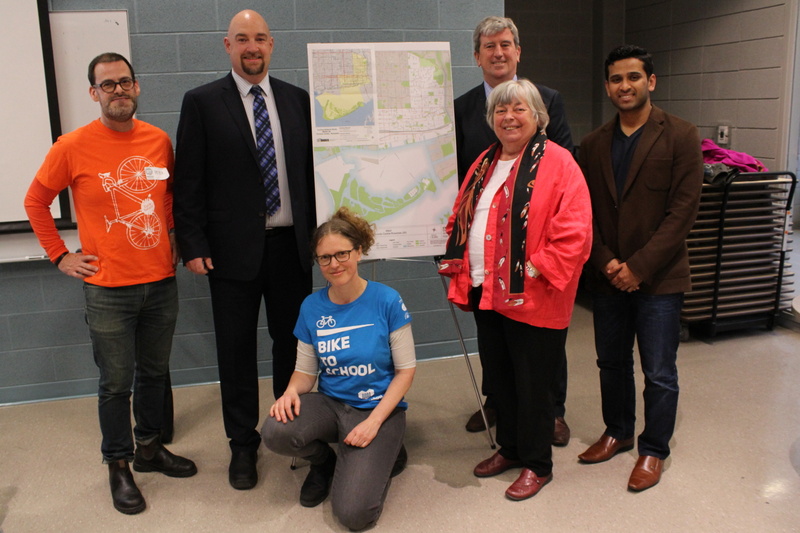 Those were Ward 28 Councillor Pam McConnell, Ontario Environment Minister and MPP Glen Murray, Ajandan Sivam with MP Bill Morneau’s office, Shawn Dillon who is the new Manager of Cycling Infrastructure and Programs, and Kristin Schwartz of CultureLink. McConnell reflected on how cycling is a lifestyle central to Ward 28 and asked those who thought cycling was only for summer to come to her deck and look down. She acknowledged Cycle Toronto (which provided a grant for the town hall) as important city builders who helped bring Ward 28 from the outrage over Gerrard Street to new cycling facilities on Queen’s Quay and Richmond-Adelaide. Murray credited McConnell as the “Johnny Appleseed of Cycling” to some laughter and declared there is no better choice to fight climate change than cycling. He highlighted his and Eleanor McMahon’s work on the #CycleON strategy, Bill 6 which required roads to factor in all road users, and the need for a sustainable cycling program beyond the up to $225 million available through the cap and trade program. Sivam briefly noted the Public Transit Infrastructure Fund, which saw over 300 projects get funded in Ontario alone. Dillon was only four weeks into his job as the cycling manager at the time and brought reinforcements via Dave Dunn. Dillon focused on the Cycling Network Plan and its development, which can be found on the City of Toronto’s website. For something new, Dillon brought up the Bicycle Parking Strategy to address a key deterrent of cycling. The strategy was launched in 2016 and is to be an eight-year plan addressing both public and private spheres. It will be developed over the summer months with a roll out starting in 2018. 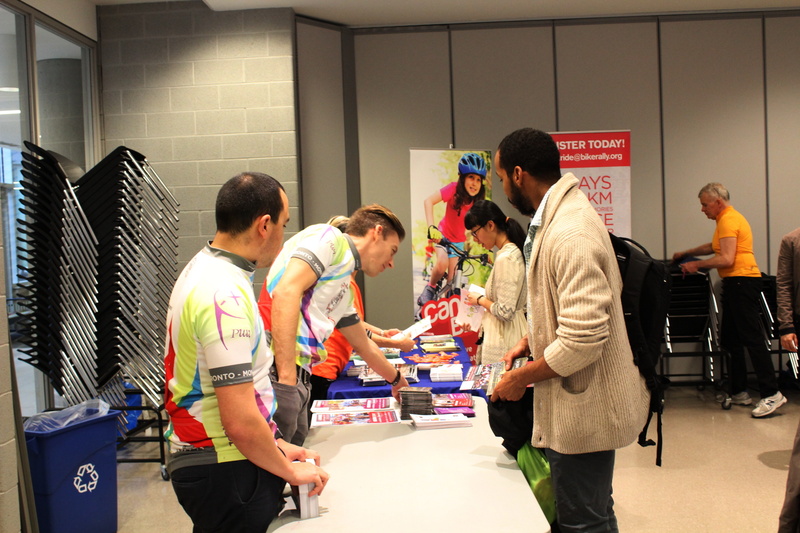 Schwartz then shifted the conversation from physical links to CultureLink, which serves 15,000 newcomers per year and offers programs such as Bike to School and Bike Host. She discussed TCAT’s Guide to Safer Streets Near Schools and highlighted a fact about children from poorer families – who walk to school more than those from wealthier families – being at an increased risk of collisions. Jason from 311 provided some quick facts about the service and how cyclists can benefit aside from fixing potholes. These include getting around road closures, helping visitors get around, and clearing catch basins. Of the 1.5 million annual inquiries, 11 000 concerned abandoned bikes & CanBike (via Parks & Rec) got 3700 requests. For a pro tip, calling 311 gets a faster response than Twitter & e-mail. The Q&A session brought up the Lower Don trail closures (which will be resurfaced), new procedures for managing work zones, the possibility of pavement patches on Shuter (à la Lansdowne), bike lane parking enforcement, and the maintenance margarita of glass, salt, and puddles. Community organizations such as Charlie’s Freewheels, Regent Wheels, Bike Sauce, Can-bike, and Friends for Life Bike Rally gave brief remarks before some refreshments (courtesy of Regent Park Catering Collective), networking, and a raffle for tune ups from Cycle Solutions, Switchback Cyclery, and Ya Bikes! Thanks to Peter, Donna, Arthur, and Bill for organizing and those wanting to get involved can follow the Ward 28 group on Facebook and Twitter. I attended the May 04 meeting, with the Deputy Mayor, Pam McConnell, Minister of the Environment and Climate Change, Glen Murray, Shawn Dillon from the City of Toronto, Ajandan (AJ) Sivam from Bill Morneau’s office and Kristin Schwartz from CultureLink. I was somewhat dismayed by two internal incidents. In discussing bicycles and potholes, the 311 representative noted that bicycle riders were in a great position to report potholes that were hazardous to bicycles. This is true enough, but better than this, bicycle riders are in the best position to report traffic hazards of all sorts and to all vehicles. Bicyclists travel at various speeds and are often less on automatic and more cognizant of their surroundings. Bicyclists are in a better position to stop to report immediate hazards, to remove hazards along their or even the auto path, or to note minor hazards for later reporting. My other source of dismay was during questioning. As valid as upset over construction along Shuter Street may be and the questioning of the lack or uniformity regarding bike lanes, I had hoped for a more forward looking response. In many ways, biking has entered the awareness of drivers. We are less an unpredictable hazard getting in their way and more an interruption needing evaluation. As bicycle riders we cherish our independence, but with independence comes responsibility. I felt that the city understood this when they legislated mandatory helmets for those aged 12 and under. This allows for independent responsibility while minimizing deterrents the continued growth of the cycling public. Now is the time for cycling to be accepted by the general public as a part of traffic, while still maintaining our cherished independence. What is needed is a “charm” offensive. How many times have you come to a Stop sign and encountered an opposing vehicle, who arrived at their Stop sign first, hesitating to make their allowed left-hand turn because of their uncertainty that the bicyclist will follow the rules of the road? Independence does not mean independence from following the rules of the road. As long as bicyclists are unpredictable in their actions within traffic, bicyclists will be considered a hazard and their independence attacked, whether it be through licensing or demands of more stringent policing. The bicycling public need to show that their independence is warranted. It is fine, and a good idea, to offer tune-ups at community events, but what about offering road safety and “rules of the road” seminars and demos as well? I would welcome an initiative from the bicycle courier companies, both package and food carriers, to require road safety and “rules of the road” seminars and demos for all current and future “professional” riders as well as the development of published guidelines for their riders, as they are not just responsible for getting their charge from A to B as fast as possible, but also very visible representatives of the bicycle in traffic. Taking the initiative will insure our independence, resisting or attempting to discount the concerns of the driving public will only increase their concern. At least in the downtown region, bicycles have arrived. What is made of them depends on bicyclists more than anything else.